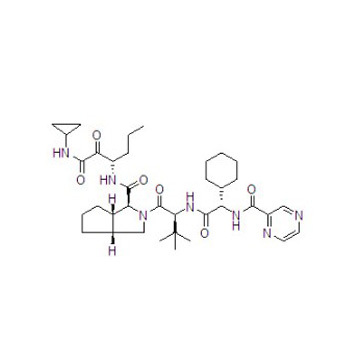 Telaprevir (VX-950), marketed under the brand names Incivek and Incivo, is a pharmaceutical drug for the treatment of hepatitis C codeveloped by Vertex Pharmaceuticals and Johnson & Johnson. It is a member of a class of antiviral drugs known as protease inhibitors. Specifically, telaprevir inhibits the hepatitis C viral enzyme NS3.4A serine protease. Telaprevir is only indicated for use against hepatitis C genotype 1 viral infections and has not been proven to have an effect on or being safe when used for other genotypes of the virus. The standard therapy of pegylated interferon and ribavirin is less effective on genotype 1.